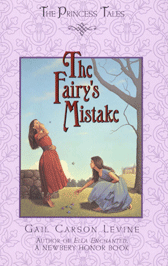 Originally The Fairy's Mistake was a picture book that couldn't find a publisher. After Ella Enchanted came out, I sent it to my editor, who asked me to turn it into a chapter book and write two more. The request came at the perfect time, just as I was figuring out if I could quit my job to write full time. I decided I could! The story comes from the fairy tale, "Toads and Diamonds," in which a pretty and sweet girl does a favor for a fairy and is rewarded by having flowers and jewels drop from her mouth whenever she speaks. A passing prince falls in love with her pretty sweetness or sweet prettiness and reasons that the falling jewels can be her dowry. They live happily ever after. Hey! I thought. He couldn't really love her. They just met. He loves the jewels. So the book sets the fairy tale straight.